Occurring every April 25th, this holiday is said to be one of Australia's most important holiday of the year. 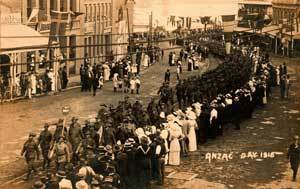 It marks the day that Australian and New Zealand military forces took action during World War I. To celebrate commemorative services are held at sunrise and ex-servicemen and women meet and join in marches through the main cities and towns. It is a day that many people reflect on the many meanings of war and its effects. ANZAC stands for Australian and New Zealand Army Corps to which those forces landed in the capital of the Ottoman Empire who was an ally with Germany. The battle lasted in an 8 month stalemate, then the ANZAC was defeated with too many deaths and damage. The day was made a holiday for the remembrance of the dead.